Normally our Monday Madness food group enjoys nipping around the fringes of Saigon’s dining underbelly. We’ve enjoyed fertile duck eggs and when they come back in season, grilled rat will be one of our scary selections d’jour. Don’t worry, you aren’t alone there…I didn’t know either that rat consumption has a proper time of year. And I hope to somehow miss this season whenever it arrives. A friend of mine who keeps halal guided our Monday Madness food group to a place called Vietnam Delights specializing in this type of food preparation in the backpackers area. I won’t even bother giving an address for I’d never again dirty the bottoms of my shoes in this joint. As a sidenote I have yet to eat a meal in this tourist oriented area tasting truly good. Perhaps the restaurant owners know they will never see the patrons again and can therefore charge more for their crappy low quality schlock. We ordered spring rolls, stir fried squid in chili and lemongrass, and curry chicken. First to arrive was a single scoop of white rice the size of an orange placed out of reach for most of us at the table. No utensils. No napkins. No plates. No nothing but a waiter quickly vanishing from sight. A highly anemic portion of squid miraculously appeared after a lengthy wait, and I guess they just expected us to use our fingers. And keep in mind this single $3 squid diced up with a tiny portion of onion could barely feed one under normal circumstances. At a highly glacial pace some utensils and plates finally arrived, and when our friend Thuy requested more rice, the waiter incredulously retorted, “Why? You don’t eat that rice?” No…it’s just not enough for four and we need some more. Crazy concept, huh? Out came more rice with attitude along with eight fried spring rolls tasting much like the pasty grease sticks at some cheap Chinese buffet. 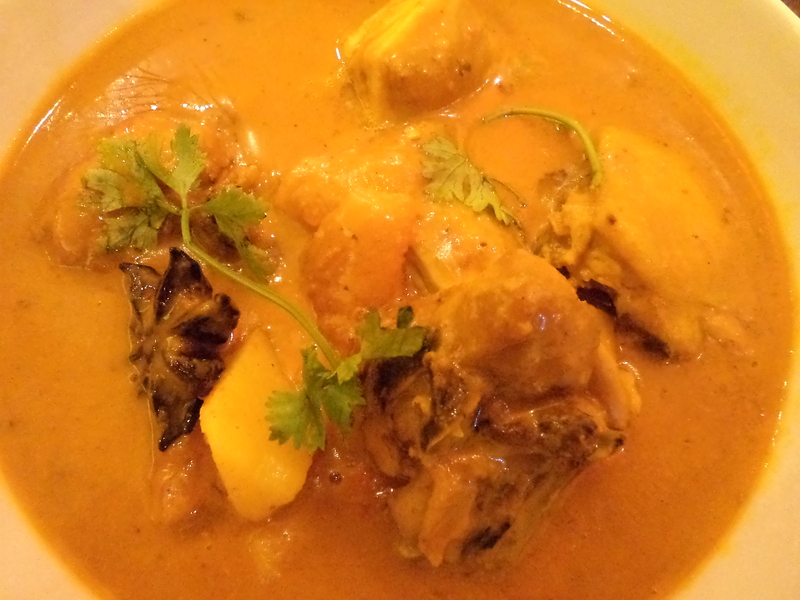 Finally the curry chicken arrived with four barren bones floating in an immense amount of yellow fluid. I watched as Jane used a spoon and fork to surgically remove a sliver of meat adhering like glue to the bone and I just said to hell with that. I ladled some sauce over my rice and called it a day.